Re-balanced Battle Chip damage was one of the more subtle, but welcomed changes to Rockman EXE: Operate Shooting. A little over thirty of Mega Man Battle Network 1's chips had their damage value increased for the better. Guts Punch and Ice Punch, for example, were buffed from 60 and 80 damage to 160 and 150, respectively. 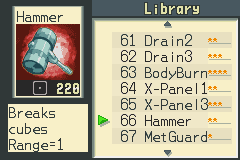 Hammer is one of the more striking examples; buffed from 100 to 220 damage! 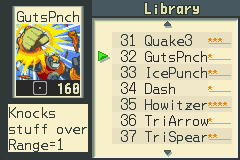 Now, these balance changes can be applied to the original Battle Network via a handy fan-patch. A cool person by the name of BOBdotEXE just released a "Operation Patch" for MMBN1. It's described as "a simple mod that aims to re-balance the battle chips as they were in “RockmanEXE operation shooting star” and "this will keep the power levels much closer to the later games in the series." Hey, it may not be the English OSS patch you've been looking for but it's pretty neat in itself. Grab it here! Someone also recently madly a patch for MM5 that lets you play as Protoman, like in MM9 and MM10, with shield use and all. Interesting. I assume that means all the Shadow Man Chips were nerfed big time as well? That was the only change to the chips I didn't like in OSS. Clock man.exe and the Starforce senirio are very very cool to me and i would love to try them out however i wanna play it in ENGLISH SO I CAN ACTUALLY play the game and understand the plot. The Clock Man scenario was pretty weak and short. Most of the gameplay just involves running back and forth to clocks in the real world and then having Mega Man progress in the short dungeon that is very straightforward. I can't recall if the boss fights were good or not, the Geo fight is short if if I remember correctly, but I think Clock Man was a decent new boss. Playable SF Mega Man broke the game too much though, his 'nerf' was he couldn't use Program Advances, but BN1 had mediocre PAs, so that wasn't really a con. He had lowered buster stats too but that didn't matter when he could lock on and jump in front of enemies with stuff like Hammer chips which now deal a lot more damage in OSS. In the end though, you're not missing out on much, I don't think the music downgrade was worth the extra content. I wish we got actual remixes like the title screen remix instead of the odd flat versions of the songs with echoes added in. They buffed chips that were otherwise useless. Guts Punch hits one square and only does like 60 damage? That's worse damage than the faster Sword chips, which deal 80 and you start out the game with them. Why ever use Hammer when you have a Fighter Sword? The game also nerfed Shadow Man's chips from doing 80, 90, and 100 in the original to 60, 70, and 80, making the new V3 only as strong as the old V1.